It was a hell of a year for HIV/AIDS. This past year, it was shown that treatment works as prevention; there was fresh hope in the fields of cure and vaccine research (one man was publicly declared cured of HIV); and everyone from global health experts to Congress to the media started talking about the end of AIDS. This year, 2011, will be remembered as the year we discovered that if we apply our resources correctly, we can start to end the epidemic. The trick is to capitalize on our amazing progress, parlaying science into policy and turning optimism into cash, to improve the lives of people living with HIV/AIDS. The key to how we do this is, in part, the POZ 100. This year’s list celebrates 100 people, things and ideas that reinvent—and improve—how we tackle HIV. We would need tens of thousands of pages to celebrate all the wonderful people and organizations bravely and effectively fighting the virus. 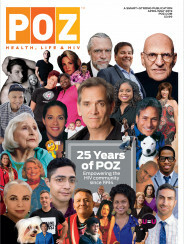 The purpose of the POZ 100 is to highlight some of those who are making big splashes right now. This year’s list is a little top heavy. By that we mean there are a lot of big names in government and global AIDS on it. But the reality of today’s pinched economy means that all AIDS funding is under heavy artillery fire. And the folks on this list have been taking the hits while defending the perimeter. They have gone to bat for our community when others would like us just to go away. And without leadership on global and domestic AIDS at the highest levels, the money expires—and so could we. That said, the survival of people with HIV has always depended on a one-two punch: leadership from the top and from the grassroots level. So you will also see heroes who are fighting in the trenches, acting as essential thorns in the side of the establishment, working as watchdogs, wielding the press to expose corruption and serving as role models. These extraordinary people prove that a single soul can change the world. Please know that each and every person living with HIV/AIDS is always on our list. As is every one of you working out there in the field, as a counselor, an HIV tester, a doctor, nurse, research scientist, fund-raiser, artist, activist, journalist, support group leader, donor, friend, partner or lover. We know it’s been tough lately, but the message we share on this World AIDS Day is that the science now gives us new justification for a renewed focus on HIV/AIDS. We know many of you don’t have jobs and are worried about money and the future of health care in America. We are too. But we also know that many fierce, smart people are fighting every day for our lives. They’re not going home until it’s over. The list on the following pages is alphabetized, and the 100th item is as important as the first. We’d love to hear about people who inspire you. 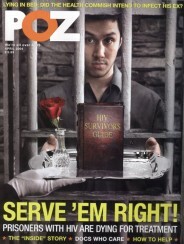 Visit poz.com/100 to post your comments and recommendations. And, join us in giving a standing ovation to this outstanding group of people, things and ideas. They show us the way to a world we all want to live in—a world free of HIV.